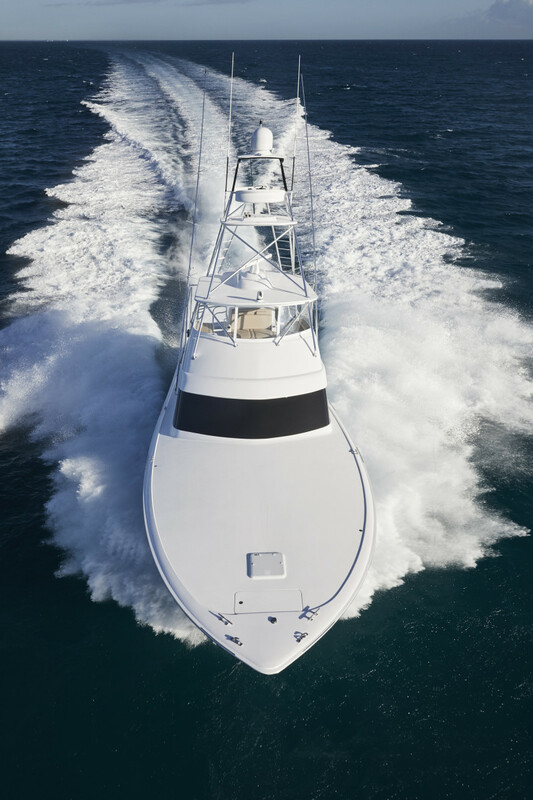 Hatteras’ newest convertible is built from the generations of hard-fished sportfishermen that came before it. A boat show isn’t the best place to land a marlin. 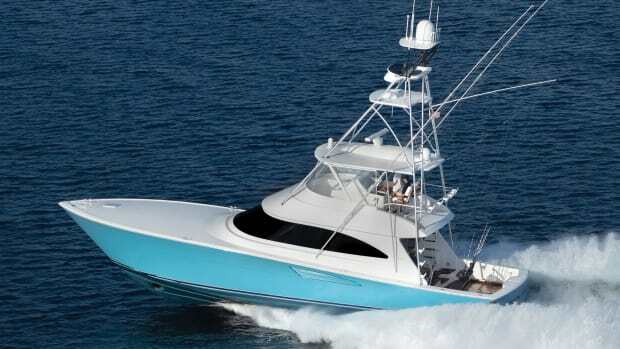 But it is a good place to land a prospective owner for your newly built sportfisherman, so waiting for me at Pier Sixty-Six Marina was Hatteras Yachts’ Director of Sportfishing Capt. Jeff Donahue, his mate Tyler Davis and Hull No. 1 of the GT59, her sleek, dark blue hull shining in the Florida sun. A little over a winding mile north along this stretch of ICW, a legion of sunglass-wearing construction workers was breaking down the 59th Ft. Lauderdale International Boat Show. Donahue and company had been one of the first cut loose, and they were reveling in their newfound freedom. After being in attendance for every day of the five-day show, I couldn’t help but feel the same way as I stepped aboard. “It kind of feels like you’ve been let out of the cage,” opined Donahue, splayed out in the expansive salon as Davis stared distractedly at his phone. Their body language said it all: The boat show, while successful, had clearly taken its toll. Now the real work could begin. If you can even call it work. While Donahue wears many hats for the New Bern, North Carolina builder, the foremost is overseeing the Hatterascal—a designation bestowed on the GT59 for 2019. It also might be one of the best jobs in the industry, one that requires captain and crew to attend a distinguished list of tournaments: from the Production vs. Custom Shootout to the White Marlin Open. 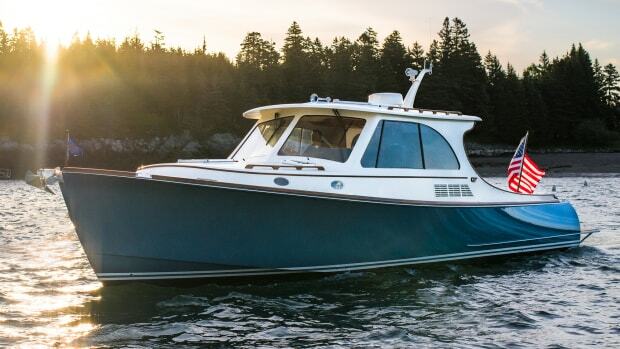 In the past, the program has commandeered almost every model in the GT line—including the 54, 63 and 70—as demo boats. Donahue’s predecessor, Capt. Terry Stansel, even went so far as to live on the old 54 with his wife, traveling to the big-fish tourneys and boat shows up and down the East Coast. 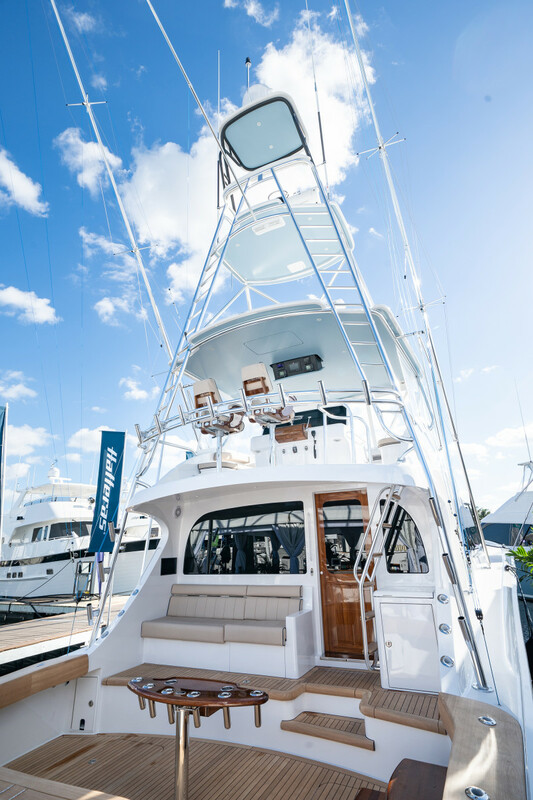 Whether hooking a trophy fish in the cockpit or lounging on the salon’s barstools, the GT59 has spaces galore for multiple guests. It was time to put that plan into action. As Donahue fired up the optional twin 1,900-hp Caterpillar C32s, Davis untied her lines and pushed out toward the Stranahan River’s busy, post-show traffic. In no time, we had jockeyed around a cabin cruiser and a couple center consoles, taking the lead through Port Everglades Inlet and running to daylight. 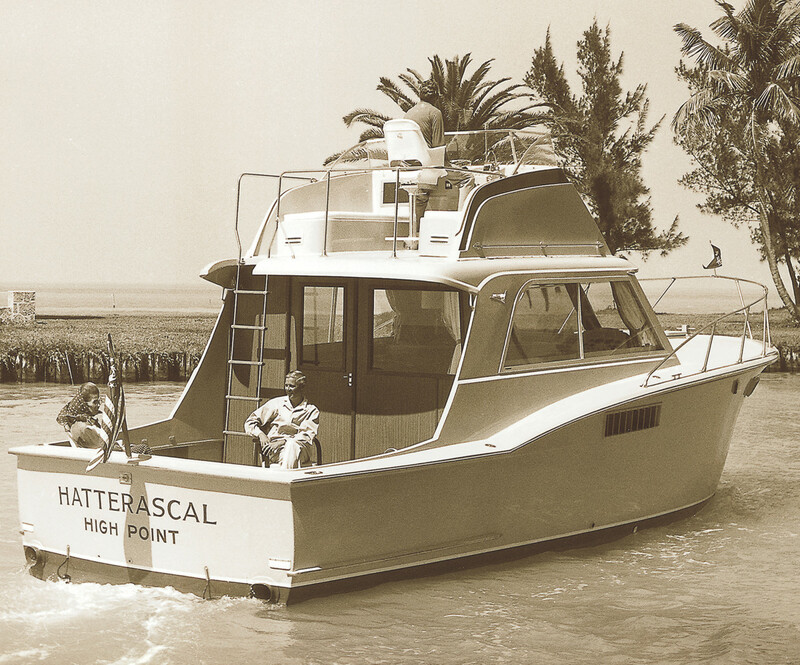 Hatteras uses the Hatterascal program to fine-tune its convertibles, from the 36C circa 1970 (below) to the GT59 of today. 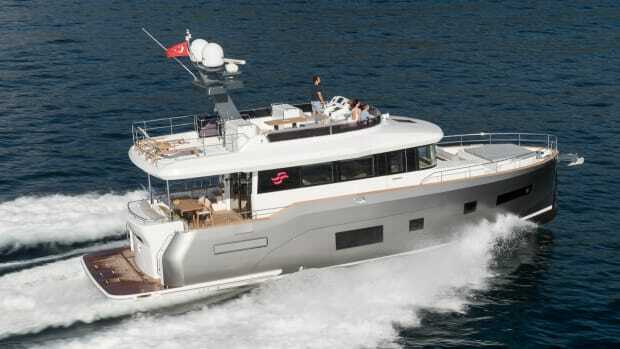 Over a decade ago, Hatteras debuted the GT60, the initial offering in the Gran Turismo lineup. As the models progressed down the line, aesthetic and mechanical improvements were implemented. Replacing the GT60, the GT59 is the current culmination of those subtle and not-so-subtle changes. For instance, the mezzanine features not only the requisite storage boxes underneath, but a bait freezer, a Garmin touchscreen to port and integrated seatback air-conditioning right around the mid-torso level. (The latter assuredly inspired by the maxim: happy crew, happy you.) And then there’s the patented deep hull tunnels that have been around for decades, which reduce shaft angles and provide maximum usable engine torque and thrust when underway or backing down. Such innovations speak to the ideas born from hard fishing on the circuit. 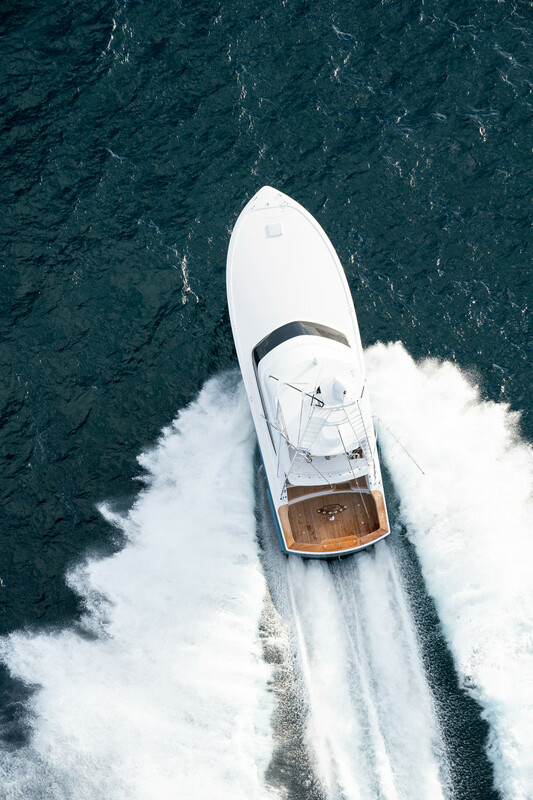 Hatteras has offered one to three fuel tanks on its convertibles over the years, owing, typically, to the boat’s center of gravity and size. On the GT59, two come standard: a 1,500-gallon integral tank forward and a 250-gallon tank aft—with the option for an additional 250-gallon auxiliary tank where a Seakeeper 16 would go. 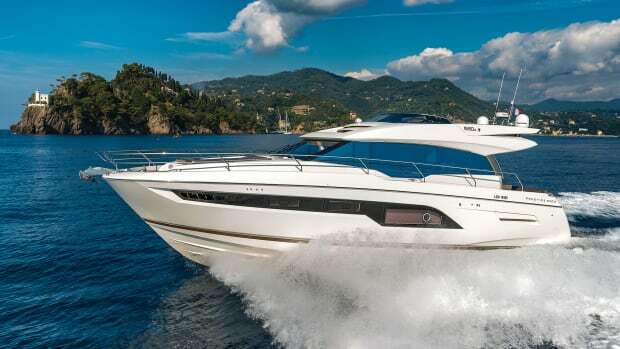 As I would soon find out, with the 1,900-hp Cats, the 59 makes a cruise speed of 33 knots at 2000 rpm and a fuel burn of 165 gph. Considering her standard fuel capacity, the 59’s range is 357 miles at cruise: more than enough, in my opinion, to effectively curb any argument for trading the Seakeeper’s proven stability in rough seas for a little more juice. I think many would-be owners will agree. As I was inspecting the rigging and storage—including two insulated fishboxes with a macerator, and a large transom fishbox that can easily accommodate a day’s worth of baitfish—Donahue motioned for me to come join him on the flybridge. 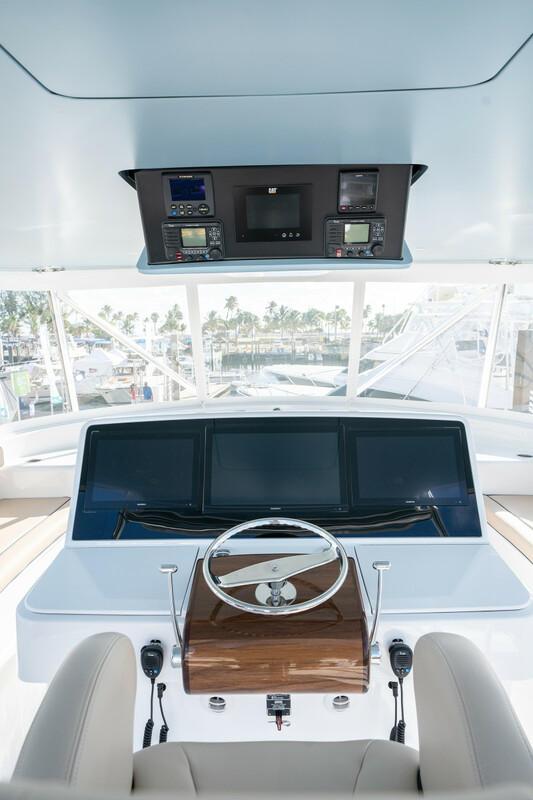 The helm featured three, flush-mounted Garmin displays in a blacked-out array (to reduce the glare) that were currently showing our fishfinder and chartplotter. For a second I imagined the 59 was fully rigged, and we were on our way to the nearest canyon. 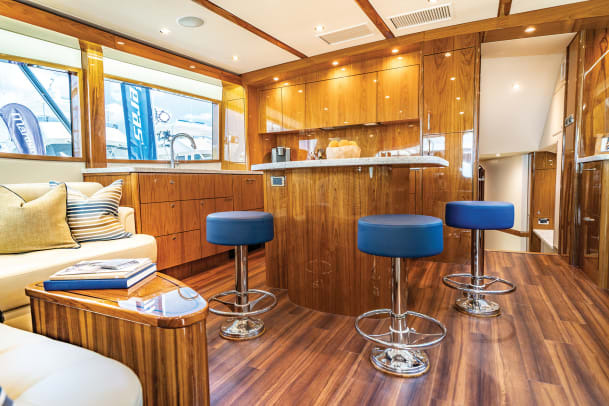 If we were, there was plenty of seating for friends and guests on the flybridge alone, including two lounges that flank either side of the helm console. Unobstructed 360-degree views from the captain’s chair looked onto a massive sunpad forward that opened to reveal a giant freezer—no more monkeying down the ladder just to snag a drink. Grabbing the wheel, the exhilaration of her rpm range snapped me back into focus. 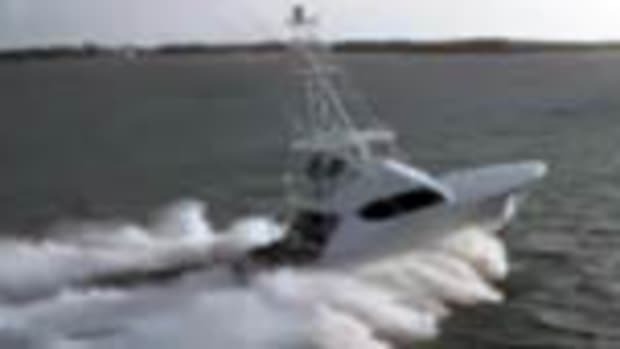 A 3- to 4-foot chop was no match for the 59’s prominent knife-like entry and variable deadrise hull that flares out in true Carolina fashion, effectively curtailing any spray. Hitting a 40-knot top end, the biggest takeaway was the smoothness of her ride. No pounding or vibration, zero spray. The way the 59 was eating up the choppy whitewater, a crew could get some undisturbed winks heading out to the fishing grounds, no problem. “It rides on a pillow of air,” said Donahue, proudly. Upon returning to the docks, I inspected the windshield closer. It looked as if it had received nary a drop. 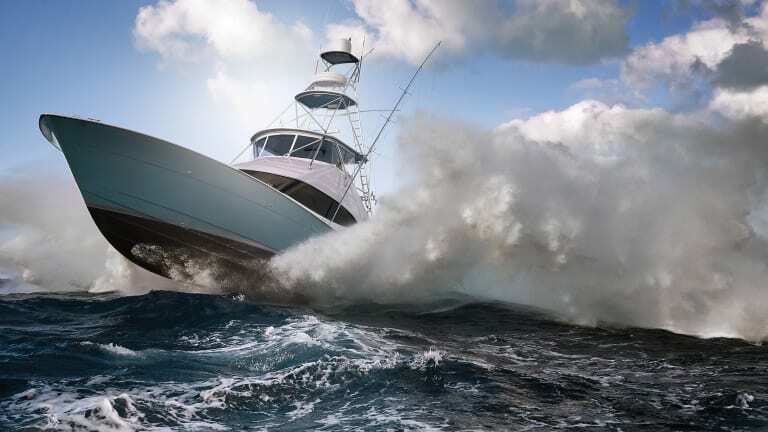 That first Hatterascal, the 34 Delux Sport Fisherman, not only helped build the company, but quite literally changed the makeup of the sportfishing industry. For decades, Slane’s competitors in North Carolina had been building fishing boats exclusively in wood. Slane, an avid offshore angler, was frustrated with the rough sea conditions off Cape Hatteras that routinely kept the local wooden sportfishing fleet at the dock. After visiting the Cristaliner Corporation in Miami, and sea-trialing a 27-foot race boat made of fiberglass, Slane had the wild notion (for the time) to use this nascent material to construct a sportfisherman out of fiberglass. People thought he was crazy. 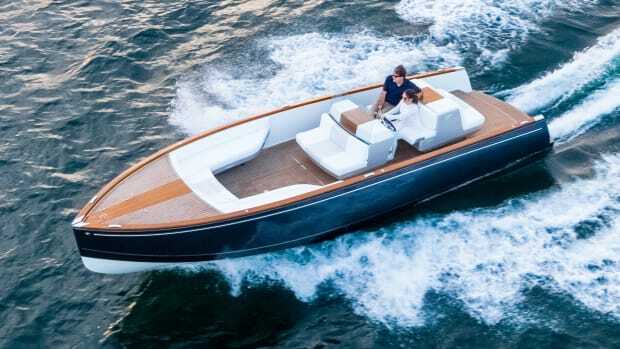 Undeterred, Slane hired young naval architect Jack Hargrave, who would go on to become a pioneering yacht designer credited with designing the 41-foot Knit Wits, the first boat over 30 feet to be built of fiberglass. That’s the story we all know. But what may not be as well documented was the eye-opening effect the Hatterascal had on customers and wooden boatbuilders alike. 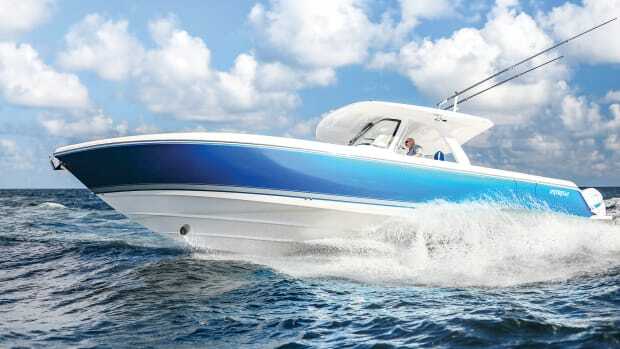 After attending the various tournaments and boat shows, the durability and strength of fiberglass—coupled with the fit and finish and comfort found aboard the 34—far outpaced anything on the market. In fact, there were more than a few manufacturers that could not make the switch and eventually folded. By allowing anglers and captains to experience the Hatterascal, the industry was largely transformed from wooden boats to fiberglass. In no small way, the 34 provided a key evolutionary step between the wooden boats that sailed the seas for millennia to the new fiberglass hulls of today. Owing to that original success, and its subsequent innovations, the Hatterascal program was going strong for decades. But when the recession hit, and purse strings got tight industry-wide, it was shelved. Jeff Donahue had recently come on board at Hatteras, and had seen the effectiveness of the program firsthand. Post-recession, there was a big push at New Bern to revive it. “Because it’s such a vital marketing tool for us,” said Donahue. (Its resurgence has coincided nicely with the popular GT series.) 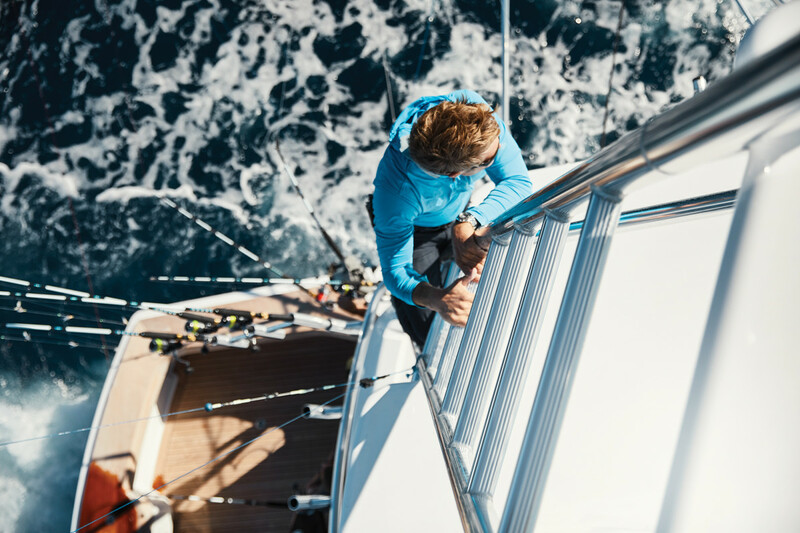 Since that time, though his position has changed—from sales manager to director of sales to director of sportfishing—he’s remained Hatterascal’s ex officio skipper. This is all in preparation for “the really hoppin’ period between May through September” where the crew will be covering a lot of ground, going from the Production vs. Custom Shootout in the Bahamas to The Mid-Atlantic Tournament in Cape May, New Jersey—Viking’s home turf. 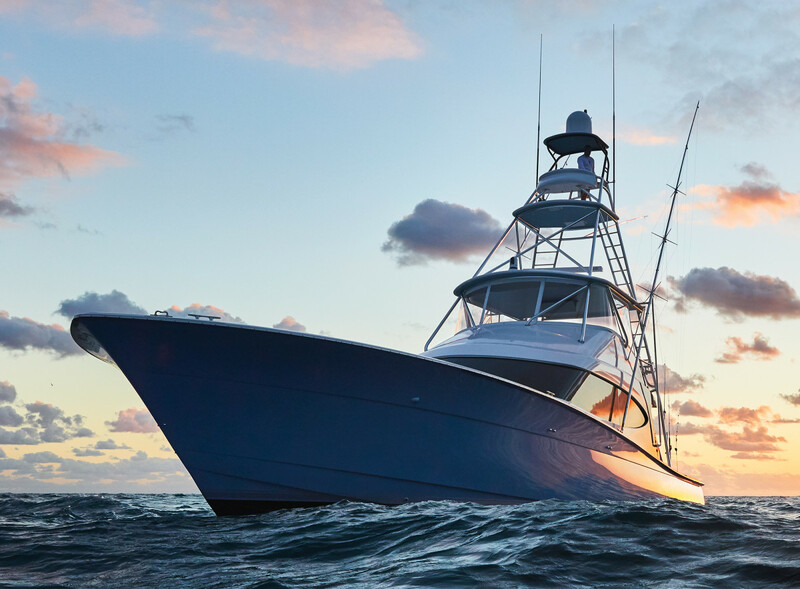 Though the Hatterascal crew goes up against Viking’s in-house team throughout the season, Donahue assured me the two sportfishing giants engage in friendly competition. This is a program focused on fun, after all, and letting others see for themselves what the newest addition to the Hatteras family is made of. Pride centers on the design, even if the fish aren’t biting. 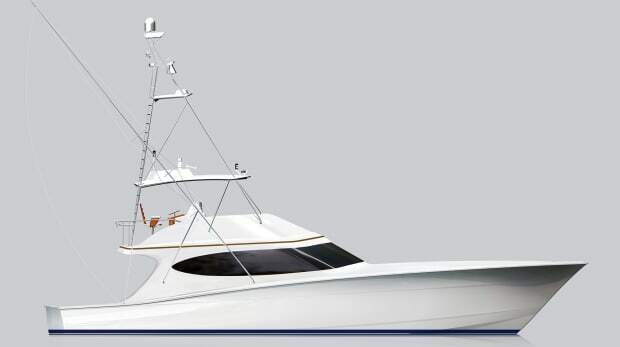 The 59’s predecessor, the 63, was the latest model to usher in a new generation of sportfishing boats. Donahue tells a story of being at a dock with a custom North Carolina builder aboard the 63 after it had recently debuted. A guy came up and greeted him warmly, congratulating him on his new boat. 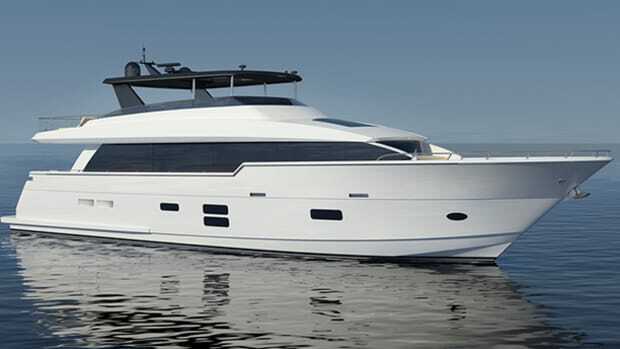 According to Donahue, “The builder said ‘I wish I could take credit for it, but it’s a Hatteras.’” Excited, Donahue went back to his design team and told them they had hit it out of the park: “People think it’s a custom boat.” That’s the goal they’ve been going for ever since—staying within their current style, but making it look more custom when possible by softening edges and keeping windows flush instead of scalloped, among other touches. When the GT65 is launched later this year, to replace the 63, it will feature all of those incremental changes throughout the years, with a focus on upgrading the helm array and an all-new engine room layout. 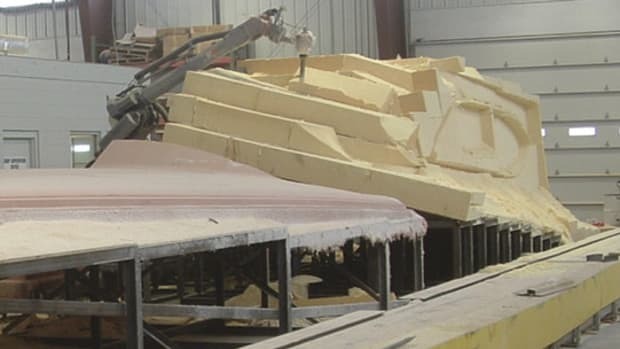 In addition, the hull and stringer system will be infused as a single part—an industry first, according to the builder—to reduce weight and increase strength. It will also most likely be the next Hatterascal. Displ. (full load): 92,000 lbs.